Privately insured pregnant women are less likely to have C-sections when their regular care includes midwives and 24-hour obstetrician coverage, according to a study by researchers at UC San Francisco and Marin General Hospital. The study published online in Obstetrics & Gynecology, on Sept. 8, compared the number of C-sections among women with private insurance, before and after an overhaul of staff practices at Marin General Hospital. Prior to April 2011, private patients at this community hospital in Northern California were managed under a conventional model, in which labor and delivery care was provided by a private physician or covering partner. In that model, the physician took calls at home or in the office and generally managed labor remotely, the authors wrote. Pregnant women who were covered by state public health insurance already had access to 24-hour in-house obstetricians and midwives, and were noted to have fewer C-sections. “In many community hospitals, labor is managed by nurses with obstetricians providing supervision by phone and typically reaching the patient in time for delivery,” said primary author Melissa Rosenstein, MD, MAS, of the UCSF Department of Obstetrics, Gynecology and Reproductive Sciences. In 2013, 32.7 percent of births were by C-section according to the Centers for Disease Control and Prevention. 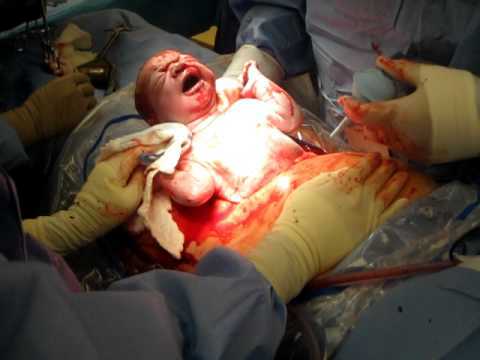 C-sections are considered a safe procedure, but are associated with a higher risk of infection to the bladder or uterus, injury to the urinary tract and complications with future pregnancies. Rosenstein and her team studied data for 3,560 first-time, single births in which the fetus was in the normal headfirst position. They also tracked the deliveries of 1,324 pregnant women with prior C-sections. Just under half of these patients were privately insured women whose care model had changed. In the years before the switch, 31.7 percent of the privately insured women underwent C-section, versus 25 percent afterwards. This downward trend continued at a rate of approximately 1.7 percent each year until the end of the study period in 2014. When they looked at privately insured women with prior C-sections, they found that vaginal deliveries after the switch had increased from 13.3 percent to 22.4 percent. The C-section delivery rates for both groups of publicly insured women, who had access to midwives and laborists throughout the study period, did not change significantly. “There are several ways in which the in-house model of care may have resulted in fewer C-sections,” said co-author Malini Nijagal, MD, who was formerly with Prima Medical Group in Novato, Calif., and Marin General Hospital in Greenbrae, Calif., and is now at Boston Medical Center. The study was supported by grants from the National Institute of Child Health and Human Development and the National Center for Advancing Translational Sciences. Additional authors are Sanae Nakagawa, MS, of the UCSF Department of Obstetrics, Gynecology and Reproductive Sciences; Steven Gregorich, PhD, of the UCSF Department of Medicine; and Miriam Kuppermann, PhD, MPH, of the UCSF departments of Obstetrics, Gynecology and Reproductive Sciences, and Epidemiology & Biostatistics. Marin General Hospital has been meeting our community’s health care needs since 1952. In keeping with the values and needs of our community, we are dedicated to treating the whole patient - mind, body and soul. Our mission - and our pride - is providing the people of Marin with the healing care they want and deserve. Our independence and patient-centric philosophy have attracted a stellar group of caring physicians, many of them leaders in their fields. Together, our care teams deliver award-winning services that are recognized by our patients and their families, as well as by independent organizations that rank us among the best.